For other people named Udham Singh, see Udham Singh (disambiguation). "Shaheed Uddham Singh" redirects here. For the 2000 film, see Shaheed Uddham Singh (film). Udham Singh (26 December 1899 – 31 July 1940), was a revolutionary belonging to the Ghadar Party best known for his assassination in London of Michael O' Dwyer, the former lieutenant governor of the Punjab in India, on 13 March 1940. 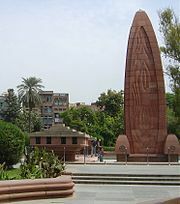 The assassination was in revenge for the Jallianwala Bagh massacre in Amritsar in 1919. Singh was subsequently tried and convicted of murder and hanged in July 1940. While in custody, he used the name Ram Mohammad Singh Azad, which represents the three major religions of Punjab and his anti-colonial sentiment. Udham Singh is a well-known figure of the Indian independence movement. He is sometimes referred to as Shaheed-i-Azam Sardar Udham Singh (the expression "Shaheed-i-Azam", means "the great martyr"). A district (Udham Singh Nagar) of Uttarakhand was named after him to pay homage in October 1995 by the then Mayawati government. Udham Singh was born as Sher Singh on 26 December 1899, at Sunam in the Sangrur district of Punjab, India. His father, Sardar Tehal Singh Jammu, was a railway crossing watchman in the village of Upalli. Troops were dispatched by lieutenant governor Michael O'Dwyer, under the command of Brigadier-General Reginald Dyer. Dyer ordered his troops to fire without warning on the assembled crowd in Jallianwala Bagh. Since the only exit was barred by soldiers, people tried to escape by climbing the park walls or jumping into a well for protection. An estimated 1,800 people were killed and over 1,200 were wounded. Udham Singh was deeply affected by the event. The lieutenant governor of Punjab, Michael O'Dwyer, had ordered the massacre, and Udham Singh held him responsible. [verification needed] Udham Singh became involved in revolutionary politics and was deeply influenced by Bhagat Singh and his revolutionary group. In 1924, Udham Singh became involved with the Ghadar Party, organizing Indians overseas towards overthrowing colonial rule. In 1927, he returned to India on orders from Bhagat Singh, bringing 25 associates as well as revolvers and ammunition. Soon after, he was arrested for possession of unlicensed arms. Revolvers, ammunition, and copies of a prohibited Ghadar Party paper called "Ghadr-i-Gunj" ("Voice of Revolt") were confiscated. He was prosecuted and sentenced to five years in prison. Upon his release from prison in 1931, Singh's movements were under constant surveillance by the Punjab police. He made his way to Kashmir, where he was able to evade the police and escape to Germany. In 1934, he reached London, where he found employment as an engineer. Privately, he formed plans to assassinate Michael O'Dwyer. In Singh's diaries for 1939 and 1940, he occasionally misspells O'Dwyer's surname as "O'Dyer", leaving a possibility he may have confused O'Dwyer with General Dyer. On 13 March 1940, Michael O'Dwyer was scheduled to speak at a joint meeting of the East India Association and the Central Asian Society (now Royal Society for Asian Affairs) at Caxton Hall, London. Singh concealed inside his jacket pocket a revolver he had earlier purchased from a soldier in a pub., then entered the hall, and found an open seat. As the meeting concluded, Singh shot O'Dwyer twice as he moved towards the speaking platform. One of these bullets passed through O'Dwyer's heart and right lung, killing him almost immediately. Others injured in the shooting included Sir Louis Dane, Lawrence Dundas, 2nd Marquess of Zetland, and Charles Cochrane-Baillie, 2nd Baron Lamington. Singh was arrested and tried for the killing. 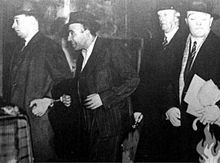 On 1 April 1940, Udham Singh was formally charged with the murder of Michael O'Dwyer, and remanded in custody at Brixton Prison. Initially asked to explain his motivations, Singh—who spoke poor English—stated: I did it because I had a grudge against him. He deserved it. I don't belong to society or anything else. I don't care. I don't mind dying. What is the use of waiting until you get old? ... Is Zetland dead? He ought to be. I put two into him? I bought the revolver from a soldier in a public house. My parents died when I was three or four. ... Only one dead? I thought I could get more. While in custody, he called himself "Ram Mohammad Singh Azad": the first three words of the name reflect the three major religious communities of Punjab (Hindu, Muslim, and Sikh); the last word "azad" (literally "free") reflects his anti-colonial sentiment. Singh was convicted of murder and sentenced to death. Following his conviction, he made a speech which the judge directed should not be released to the press. On 31 July 1940, Singh was hanged at Pentonville Prison. His remains are preserved at the Jallianwala Bagh in Amritsar, Punjab. On every 31 July, marches are held in Sunam by various organisations and every statue of Singh in the city is paid tribute with flower garlands. Although many Indians regarded Singh's actions as a response to some brutal aspects of British colonial rule, officially, his actions were deplored and condemned in India, with Mahatma Gandhi referring to Singh's actions as "an act of insanity", stating: "The outrage has caused me deep pain. I regard it as an act of insanity ... I hope this will not be allowed to affect political judgement." The Hindustan Socialist Republican Army condemned Mahatma Gandhi's statement, considering this to be a challenge to the Indian Youths. Pt Jawaharlal Nehru wrote in The National Herald, "[The] assassination is regretted but it is earnestly hoped that it will not have far-reaching repercussions on [the] political future of India." In its 18 March 1940 issue, Amrita Bazar Patrika wrote, "O'Dwyer's name is connected with Punjab incidents which India will never forget". The Punjab section of Congress in the Punjab Assembly led by Dewan Chaman Lal refused to vote for the Premier's motion to condemn the assassination. In April 1940, at the Annual Session of the All India Congress Committee held in commemoration of 21st anniversary of the Jallianwala Bagh Massacre, the youth wing of the Indian National Congress Party displayed revolutionary slogans in support of Singh, applauding his action as patriotic and heroic. Singh had some support from the international press. The Times of London called him a "fighter for freedom", his actions "an expression of the pent-up fury of the downtrodden Indian people." Bergeret from Rome praised Singh's action as courageous. In March 1940, Indian National Congress leader Jawahar Lal Nehru, condemned the action of Singh as senseless, however, in 1962, Nehru reversed his stance and applauded Singh with the following published statement: "I salute Shaheed-i-Azam Udham Singh with reverence who had kissed the noose so that we may be free." In 1974, Singh's remains were exhumed and repatriated to India at the request of MLA Sadhu Singh Thind. Thind accompanied the remains back to India, where the casket was received by Indira Gandhi, Shankar Dayal Sharma and Zail Singh. Udham Singh was later cremated in his birthplace of Sunam in Punjab and his ashes were scattered in the Sutlej river. Some of his ashes were retained; these retained ashes are kept inside a sealed urn at Jallianwala Bagh. A charity dedicated to Singh operates on Soho Road, Birmingham. A museum dedicated to Singh is located in Amritsar, near Jallianwala Bagh. Singh's weapon, a knife, his diary, and a bullet from the shooting are kept in the Black Museum of Scotland Yard. Singh has been the subject of a number of films: Jallian Wala Bagh (1977), Shaheed Uddham Singh (1977), and Shaheed Uddham Singh (2000). Udham Singh Nagar district in Uttarakhand is named after Singh. Singh is the subject of the 1998 track "Assassin" by Asian Dub Foundation. The day of his death is a public holiday in Punjab. and Haryana. Singh is the subject of the 2015 music video and track "Frank Brazil" by The Ska Vengers. A statue of him was installed at the Jallianwala Bagh, Amritsar in March 2018. ^ Swami, Praveen (November 1997). "Jallianwala Bagh revisited: A look at the actual history of one of the most shocking events of the independence struggle". Frontline. 22. 14. India. pp. 1–14. ^ a b Farina Mir (2010). The Social Space of Language: Vernacular Culture in British Colonial Punjab. University of California Press. p. 16. ISBN 978-0-520-94764-1. ^ Singh, Anand Raj (12 March 2015). "Mayawati may create new district to tame old foe". The New Indian Express. Retrieved 14 May 2016. ^ a b Sikander Singh (2002). Pre-meditated Plan of Jallianwala Massacre and Oath of Revenge, Udham Singh alias Ram Mohammad Singh Azad. p. 139. ^ Stephen Stratford. "British Military & Criminal History". ^ Academy of Punjab in North America. "Shaheed Udham Singh (1899-1940)". ^ Dr. Fauja Singh (1972). Eminent Freedom Fighters of Punjab. pp. 239–40. ^ Singh, Sikander (1998). Udham Singh, alias, Ram Mohammed Singh Azad: a saga of the freedom movement and Jallianwala Bagh. B. Chattar Singh Jiwan Singh. ^ Singh, Sikander (1998). Udham Singh, alias, Ram Mohammed Singh Azad: a saga of the freedom movement and Jallianwala Bagh. B. Chattar Singh Jiwan Singh. p. 216. ^ National Herald, 15 March 1940. ^ Vinay Lal (May 2008). "Manas: History and Politics, British India - Udham Singh in the Popular Memory". Retrieved 23 May 2014. ^ a b Singh, Sikander (1998). Udham Singh, alias, Ram Mohammed Singh Azad: a saga of the freedom movement and Jallianwala Bagh. B. Chattar Singh Jiwan Singh. p. 300. ^ Manmath Nath Gupta (1970). Bhagat Singh and his Times. Delhi. p. 18. ^ Public and Judicial Department, File No L/P + J/7/3822. 10 Caxton Hall outrage. London: India Office Library and Records. pp. 13–14. ^ "Government of Punjab, India". ^ "Public Holidays 2016 and 2017". ^ "Indian pop video honours activist's 1940 killing of British official". The Guardian. 31 July 2015. An article on Udham Singh—Hero Extraordinary in "The Legacy of The Punjab" by R M Chopra, 1997, Punjabee Bradree, Calcutta. This page was last edited on 16 April 2019, at 04:47 (UTC).